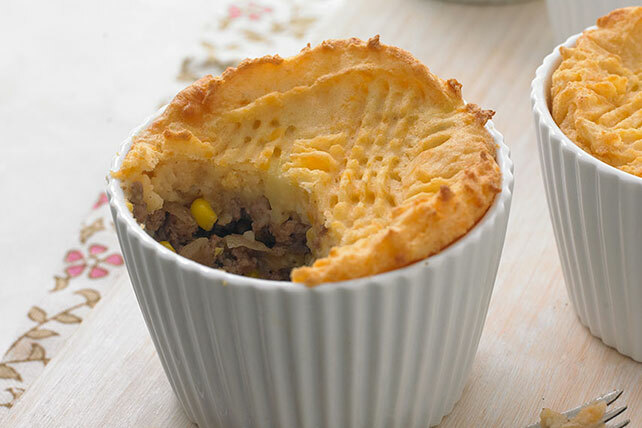 Loaded with cheesy flavor, this easy-to-make Crisscross Shepherd's Pie is a hearty recipe you can make ahead of time for busy weeknights. Cook potatoes and garlic in boiling water in large saucepan 15 min. or until potatoes are tender. Meanwhile, brown meat with onions in large skillet; drain. Return to skillet. Stir in corn, water and soup mix; cook 3 min. or until water is absorbed, stirring frequently. Spoon into 8 ramekins. Drain potatoes; return to pan. Add cheddar and cream cheese spread; mash until potatoes are smooth and mixture is well blended. Spoon over meat mixture. Make decorative crisscross or crosshatch pattern by lightly dragging fork over potato layer. Bake four and freeze four. Or, choose how many you want to bake now and freeze the remaining filled ramekins to have on hand for any emergency last-minute meals. Assemble recipe as directed; wrap in heavy-duty foil. Freeze up to 1 month. When ready to serve, thaw overnight in refrigerator. Bake, covered, 25 to 30 min. or until heated through, uncovering for the last 10 min.